Was the FBI headquarters relocation scrapped to protect Trump’s hotel from competition? President Trump has many well documented conflicts of interest that leave his administration vulnerable to foreign influence and corruption. One instance where Trump’s business interests may have presented consequences for the American people is the case of the FBI headquarters. After 12 years and $20 million were spent planning a relocation of the FBI headquarters, the project was abruptly cancelled. Trump was more involved in the cancellation than a senior administration official first suggested. If the headquarters had moved, its location just down the street from Trump’s eponymous hotel would have been available for competing retail and hotel space. If the president spiked the FBI headquarters move to protect his business from competition, he put his own bottom line above fiscal responsibility and national security. Given the unsustainable status quo, the FBI and GSA worked to estimate costs and identify options for a new headquarters. The most expensive option was modernizing the current headquarters, at an estimated $1.7 billion. A later estimate found the renovation would cost between $850 million and $1.1 billion, but would only accommodate 52 percent of the headquarters workforce. Another option was rebuilding from scratch on the same site, which was estimated to cost at least $850 million. The final–and winning–option was moving to a new site where the staff could be centralized and more easily secured. The estimated cost was $1.2 billion, but would ultimately save the government about $1 billion over 20 years by eliminating the need to lease other facilities. In 2012, GSA proposed going forward with relocation of the headquarters, a plan which had the benefit of addressing all of the FBI’s major concerns. By 2014, GSA narrowed the options to three sites in the D.C. metro area. In 2016, the FBI secured funding in President Obama’s budget, and GSA’s project executive at the time, Bill Dowd, was confident that the amount, in addition to the value of the current building, “would be sufficient to afford the new campus.” GSA requested proposals from real estate firms, and announced it would select a location and developer in March 2017. Going ahead with a move would leave the FBI’s downtown site to be developed into a mixed-use complex likely including offices, a hotel, restaurant, apartments, and retail space. Meanwhile, the Trump International Hotel opened in September 2016 in the Old Post Office, just down the street from the FBI headquarters on Pennsylvania Avenue. In January 2017, President Trump was sworn in, giving him power over GSA, while also leasing the Old Post Office building from GSA (even though his lease appeared to prohibit him from holding office and the lease at the same time). The area is prime real estate for a luxury hotel, and GSA received at least 10 bids on the site, including from other high end hoteliers. Indeed, the Trump Hotel has been extremely profitable for the president, and he reported over $40 million in hotel-related revenue for calendar year 2017. 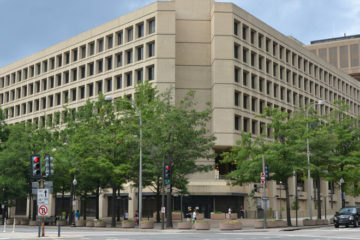 In February 2018, the FBI announced that instead of moving, it will build a new headquarters on the old site. The plan is estimated to cost $3.3 billion and will require 2,300 staff to move to other locations — a costly plan that does not address the needs that prompted the project. The decision to cancel the FBI’s move was met with puzzlement and frustration about wasted time and resources from elected leaders of both parties, especially as justifications for the cancellation seemed to fall short. A GSA Inspector General report released on August 27th, 2018 revealed that Administrator Murphy’s testimony was “incomplete and may have left the misleading impression that she had no discussions with the President or senior White House officials” about the FBI headquarters project. In fact, Murphy met twice about the FBI project with President Trump, and once with White House Chief of Staff John Kelly (without President Trump). One of the meetings with Trump was just weeks before the announcement that the headquarters would be rebuilt on the same site. President Trump reportedly has become “personally involved in plotting a new FBI headquarters” and is treating the renovation like a Trump Organization project. Why have the President and his Chief of Staff taken such an interest in the FBI headquarters project, and why did the GSA Administrator conceal their interest? The president’s financial stake in his nearby hotel might help answer those questions. CREW is currently in litigation with GSA to obtain records about the move’s cancellation to understand the underlying motivation and President Trump’s full role. After more than a decade of planning, the FBI settled on a costly option that does not address the key needs that prompted the project. There is reason to believe that the president sabotaged an upgrade for the infrastructure of the FBI that would have saved significant taxpayer dollars. There is also reason to believe that doing so would serve the interests of his family business. If personal profits played into the decision to cancel the FBI move, President Trump proved once and for all that his primary concern is not the public interest, but his own bottom line. GSA performed a myopic search that turned over only a handful of records out of tens of thousands on the FBI headquarters relocation project.